We have reported that after the final season of ’24’, that wasn’t the last we will have heard from Jack Bauer. There is a movie in the works for ’24’, but now it looks like it will be delayed a year or two. Everything has been greenlit and ready to go, but since Kiefer Sutherland is filming his new series ‘Touch’, he only gets a small window of a break between seasons and he and the filmmakers felt it would be rushed to do the ’24’ film. So the problem here is will Kiefer have enough time in between any season of ‘Touch’ to film ’24’ the movie? Hopefully everyone will find a bit of time to do this movie. I was a huge fan of ’24’ and I still look forward to a new Jack Bauer story. 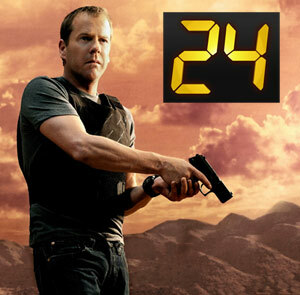 Hopefully in 2013 or 2014 we will get our ’24’ film. I’d hope by Sutherland’s next break in between seasons, they will have already planned and executed all production aspects so they can just have Kiefer walk on and do his work. Anil Kapoor Sliding into Producer’s Chair! This entry was posted on Wednesday, March 14th, 2012 at 11:54 am	and is filed under Film, News. You can follow any responses to this entry through the RSS 2.0 feed. You can skip to the end and leave a response. Pinging is currently not allowed. « Jeremy Irons Joins Cast Of ‘Beautiful Creatures’!! !